Best coffee makers for under $50. 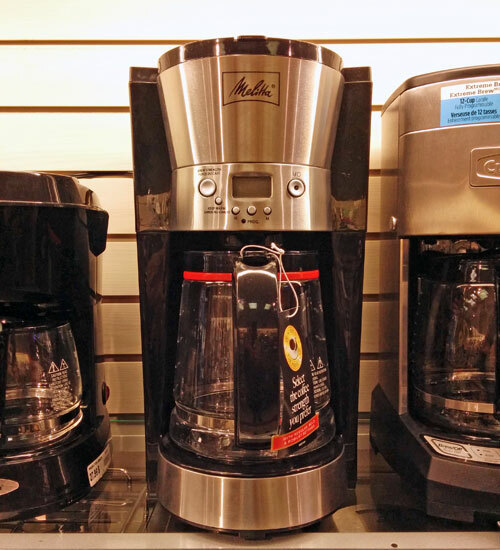 Melitta 46893A 12-Cup Programmable Coffeemaker for under $50. Perhaps surprisingly you have quite a few options when shopping for a coffee maker for under $50. And the better news is that you don't have to compromise on the quality of the coffee you brew. All you'll lose is the extra convenience and various bells and whistles included with more expensive brewers. What you'll find on this page is a description of the various kinds of brewer you can get for less than $50, and a link that will take you to a product page at Amazon.com. (Amazon.com because their prices are almost always the best.) Or you can buy them at a local store. These are the brewers you'll find on millions of counter tops and office kitchens across North America. This is the automated version of the filter cone brewing method. The brewer heats the water to the correct temperature and then sprays the water over the ground coffee. The coffee is then served from the glass carafe that sits beneath the filter. You can pay a lot for a top-end drip brewer. But you can also get them for less than $50 bucks. That's a pretty good price for a 12-cup coffee maker, and only goes to show that shopping for a coffee maker doesn't have to cost an arm and a leg. The best deal we have found is for the Melitta 12-Cup Programmable Coffeemaker (photo at the top of the page) which is often on special offer for under $50. Made famous by Melitta, the filter cone is a plastic cone that sits on the top of your mug or cup. Place a paper filter in the cone, add ground coffee and then pour hot water over the coffee grinds. This is coffee making at its simplest. All you need is the cone, some filters and a kettle. How much? You can buy the cone and a pack of filters for under $10. And here's the funny part. (Funny if your neighbor just spent $200 on a coffee maker.) You can make excellent coffee this way. The secret is to control the pour of hot water...wetting the grinds, pausing for a moment, and then thoroughly soaking all the grinds by pouring in a circular motion from the outside in. This gives you a richer tasting coffee, and is something you can't do with automated drip brewers, because the whole process is enclosed. Here's a cone filter and carafe, for making several cups at a time. And here's a cone and mug for one cup at a time. The French Press or Press pot. The French press has been around for a very long time. It's simply a glass beaker with vertical sides, with a plunger that includes a mesh filter. You can buy a French press for anything between $10 and $30, depending on the size. Best of all, it's easy to use and will make a better cup of coffee than many brewers that cost several times as much. You'll find a selection of French presses here. Bestselling coffee makers on Amazon.com. Related information you might find interesting. How to find the best coffee makers. Single Cup Coffee Makers - gourmet coffee without the mess. Simpler and more hands-on ways to make a great cup of gourmet coffee.